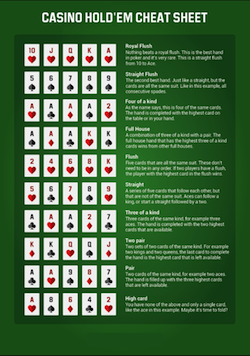 Casino Holdem, or Live Dealer Holdem, is a variation on the popular game – Texas Holdem. The main difference is that you are not playing against other players, just against the dealer. The game is a popular one at virtual casinos. However, some players do not have absolute faith in the randomness of the cards in the virtual game. Even despite the fact that the large majority of online casinos are rigorously tested by independent auditors. Because of this, online casinos have moved into the Live Dealer Casino platforms. With Live Casino Hold ’em you’ll be playing with a real dealer. You’ll see the stream real-time, gambling on the cards as they are dealt – the only virtual part of the game being the betting area. 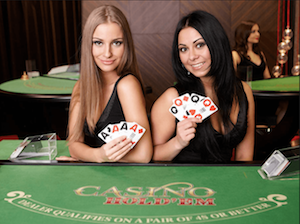 The majority of Live Casinos feature attractive female dealers. This has led to a surge in popularity of Live Dealer Holdem and other live casino games. 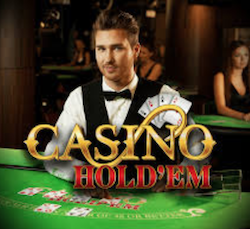 Live Dealer Holdem (as well as other games such as Roulette, Blackjack and Baccarat) is playable at the majority of online casinos offering the live dealer option. These casinos are licensees of Live Casino companies, including Evolution Gaming, PlayTech, MicroGaming, Visionary iGaming and Global Gaming Labs who stream the games from their dedicated studios. The casino sites can use either the standard tables available across multiple sites or bespoke tables featuring additional branding for the casino. Texas Holdem is a game where each player will receive two cards, along with five community cards, making the best five card hand from the seven. In Traditional Texas Holdem you’ll be up against one or more players, with multiple betting rounds and on occasions, very large pots. Casino Hold ’em is a game which you’ll play against a dealer, offering different rules and ways of winning. Here is a run-down of the rules. You’ll start by posting an ante (this is your choice of the stake; the upper and lower limits will be set by the individual casino). You and the dealer will be dealt two cards, your cards will be face up and the dealers won’t. Then the first three community cards will be dealt. You’ll then decide whether to “fold” or “call”. A fold will mean the hand is over and you will lose your ante. If you call, you’ll have to place another bet which is double the size of the ante – so if your initial ante is $1, to call will cost you an additional $2. Next, the final two community cards are dealt, and the dealer will turn their hand over. The first consideration is whether or not the dealer qualifies – if the dealer has a pair of fours or better they will be deemed to have a qualified hand. You’ll then compare your hand to the dealer. If the dealer has a qualified hand and you win, you’ll win both the ante and the call bet (a profit of $3 using the $1 ante example above). If you win and the dealer doesn’t have a qualified hand, you’ll win just your ante, the call bet being a push (a profit of $1 using the above example). You’ll also be able to win extra based upon the strength of your hand. For example, a flush pays 2 to 1 on your ante bet, a Royal Flush paying a whopping 100 to 1. The payouts will be printed on the table itself. Obviously, if you lose to the dealer, you’ll lose both your ante and call bets. If you win and the dealer doesn’t have a qualified hand, you’ll win just your ante, the call bet being a push (a profit of $1 using the above example). You’ll also be able to win extra based upon the strength of your hand. For example, a flush pays 2 to 1 on your ante bet, a Royal Flush paying a whopping 100 to 1. The payouts will be printed on the table itself. Obviously, if you lose to the dealer, you’ll lose both your ante and call bets. Many tables offer an ‘AA’ side bet. This involves gambling on whether the player’s two cards and the first three community cards will make a pair of Aces or better. The better the hand, the higher return you’ll receive – once again the payout amounts will be printed on the table. Obviously, if the hand is less than a pair of Aces, you’ll lose your stake. When playing Live Dealer Casino Holdem you’ll have the opportunity to interact with both the dealer and other players through a chat box. The dealer interacts verbally. The other players interact through the chat box. You’ll also have various other options at the tables, including changing the picture quality, adjusting the sound, changing the camera angles and auto re-bet options. You’ll also be able to tip the dealer if you win. The majority of online casinos offering live dealer games will give players bonuses both as an enticement to stay at the site and to attract new customers. The new sign-up bonuses are usually the biggest. In most cases, the bonus is a percentage of the deposit amount and will be subject to a playthrough requirement before the bonus is yours. Make sure you check for special offers, many casinos are currently keen to promote their live-dealer rooms and will give you chips to try out the games. These are some of our recommended online live casinos at which you can play Live Dealer Holdem. They offer great welcome bonuses and other great features. Best Casino Software – Live Hold’em at 888 combines the fast-paced speed of traditional online poker and seamlessly merges it with live dealers for the ultimate experience! Get up to £888 No Deposit Bonus & up to £100 Welcome Bonus. Sign up here. Best International Live Casino – Play Live Dealer Holdem at Betway‘s Live Casino. Take a seat at one of our tables for a poker experience that’s as real as it gets. More chances to win and additional rewards up for grabs. Enjoy up to $1,000 Welcome Bonus when you join.